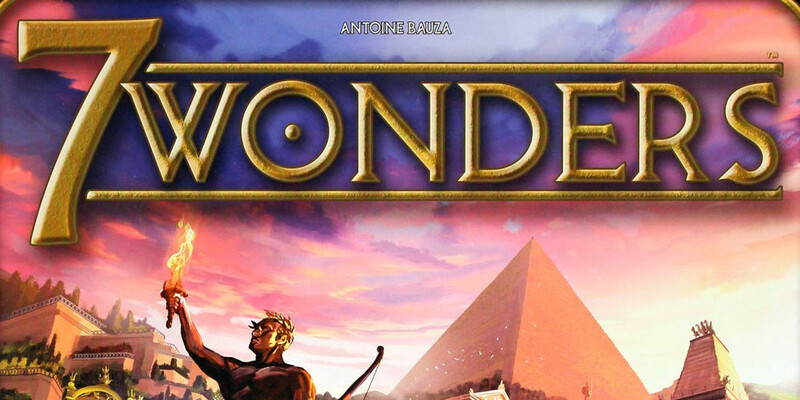 This July 7th is a very special day for us on Board Game Arena, as we are incredibly proud to introduce the most awarded game of all times and one of your most voted games in our most expected poll: 7 Wonders, a game by Antoine Bauza published by Repos Production. For 8 years now, we have been working hard to build the best service for online boardgaming. We may not be the most beautiful one, we may not be the most easy-to-use, but we are passionate players providing a service for other passionate players, and this probably explains why you made BGA the most popular one. Today, a huge best-seller game is joining BGA because you made BGA so successful along the years: thank you everyone ! 7 Wonders is a civilization cards game for 3-7 players based on a "draft" mechanism: you play one card then give the remaining cards to the next player. The game has 3 rounds ("ages"). On each round, you receive a hand of 7 cards, and play 6 of them following the draft rules, and discard the last one. Some cards provide you resources, and some cards have cost requirements you must fulfill to play them. Instead of playing a card, you can also choose to place it under your "Wonder" by paying the cost of the associated "Wonder step". Usually, it provides you victory points and/or special abilities. If you want to learn the full rules of the game, we recommend the following video. The nicest thing about 7 Wonders is that everyone plays simultaneously, which makes each game very fast, even with 4+ players: a realtime game here on BGA lasts 10 to 15 minutes. But playing simultaneously doesn't mean that you can forget your opponents: the interaction between players is everywhere, as you see and select cards that you pass to your neighbors, or combat them at the end of each round. This explains why this game is now a board game classic, awarded by the Spiel Des Jahres, the Golden Geek award, the Deutscher Spiele Preis, the As d'or, and so on. Whether you know the game already or not, we strongly encourage you to start a game on BGA and enjoy it! 7 Wonders is part of Board Game Arena Premium catalog. Like the other Premium games (Carcassonne, Terra Mystica, ...), you need to be a Premium member to create a new table of the game, and after that you can play with whoever you want to (Premium or not). You can find here all the other features brought by Premium. Board Game Arena would like to send a very special thank you to the whole team of Repos Production for giving us the possibility to make this game available here. Some of you may know that BGA and Repos had been discussing this for a long time, and we are wonderfully happy to finally make it happen today! This is a big one that a week ago I would have guessed you'd never be able to get. Good job, and keep 'em coming!